A friend of Kirsten's had a birthday party last month, and I happened to know that he is rather fond of dinosaurs. So I got him some big dinosaurs, but I also got him a pack of 24 mini-dinosaurs all about an inch long or so. I figured they'd be perfect to play with at home or doctor appointments, but was worried it'd be relatively easy to lose track of all those little guys. I grabbed a pair of my husband's old Levi's that had gotten too worn at the knees and hem and had ended up in the scrap fabric box in my closet. I cut a generous section from the calf area and quite liked the outer seam and wanted to incorporate it into the bag still. I used that as the bottom edge and initially sewed up the bag using just the denim fabric. Well, it didn't gather very well at the top so it didn't draw tight and keep closed. So, I sewed a bit of cotton fabric to the top and added the drawstring pocket in that material, after which it closed nicely. 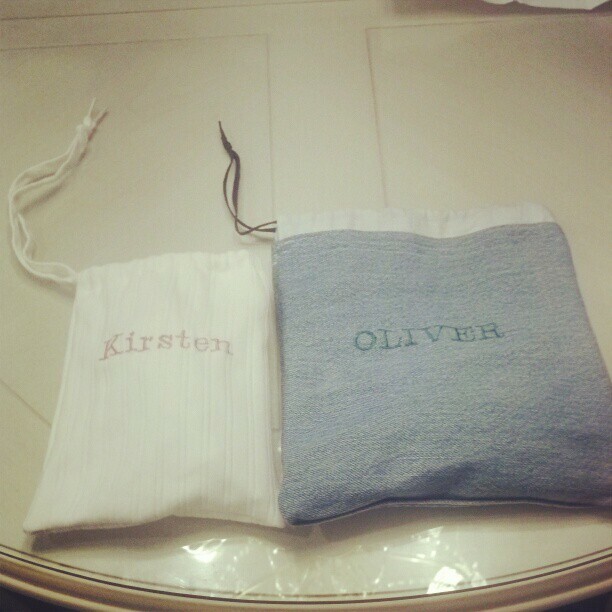 I have an embroidery machine so I added his name to the front of the bag in a dark green before sewing it all together. The drawstring is just a new shoelace. His will fit all the small dinosaurs and a few big ones too, or a handful of cars or small books. Whatever treasures he cares to put in it. After I made one for her friend, I stitched up one for my daughter too, just a little smaller and filled it with a matching set of dinosaurs. Hers is a knit fabric, so I first sewed the bottom shut, since that's the edge that will stretch, then sewed up the sides and then sewed a little pocket at the top. Again, I used a shoelace for the drawstring. The nice thing about using a shoelace is, thanks to the aglets at the tips, it won't fray. There are tons of drawstring bag tutorials online, here's a whole page of them at Sew Mama Sew. I just looked at a few, then did my own thing. One tip is to pin a safety pin at the end of your drawstring to work it through your pocket, much easier to get it through that way.